Dogs Bite Decatur Al: HUDDERSFIELD ENGLAND - DAVID ELLAM, 52, WAS WALKING HIS BELOVED YORKIE WHEN THEY WERE ATTACKED BY A DOG THAT HAD RECENTLY BEEN INVESTIGATED BECAUSE IT LOOKED LIKE AN AGGRESSIVE BANNED BREED BUT IT WAS DETERMINED IT WAS NOT ...A PIT BULL - SO IT YANKED, TUGGED AND GRIPPED ON DAVID UNTIL PARTS OF HIS LEG WAS MISSING - THEN IT WENT TO HIS NECK AND HE LOST OVER HALF HIS BLOOD AND DIED - WHAT WAS THE BREED? WHERE'S THE PICTURE? HUDDERSFIELD ENGLAND - DAVID ELLAM, 52, WAS WALKING HIS BELOVED YORKIE WHEN THEY WERE ATTACKED BY A DOG THAT HAD RECENTLY BEEN INVESTIGATED BECAUSE IT LOOKED LIKE AN AGGRESSIVE BANNED BREED BUT IT WAS DETERMINED IT WAS NOT ...A PIT BULL - SO IT YANKED, TUGGED AND GRIPPED ON DAVID UNTIL PARTS OF HIS LEG WAS MISSING - THEN IT WENT TO HIS NECK AND HE LOST OVER HALF HIS BLOOD AND DIED - WHAT WAS THE BREED? WHERE'S THE PICTURE? "Another witness - who asked not to be named - said: "The victim was shouting and whaling 'help me' in a blood-curdling type of splattering noise - it was awful. "There was literally blood everywhere."" 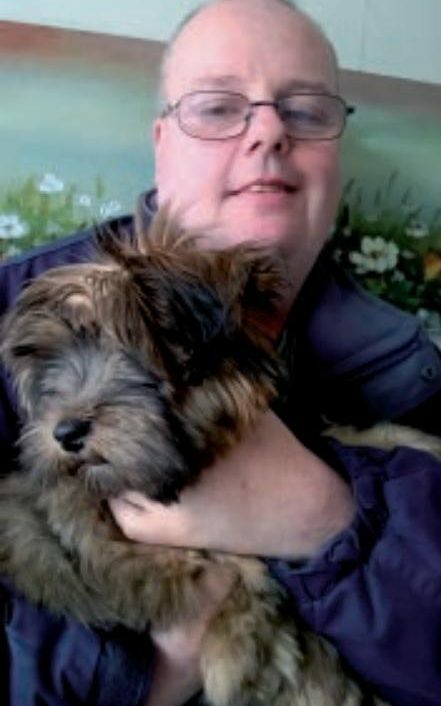 A YORKSHIRE man who died after being attacked by a dangerous dog days after it was returned to its owner has been named as David Ellam. David, 52, from Huddersfield was set upon by the animal while walking in the Sheepridge area of Huddersfield. The shocking attack happened after the dog – INITIALLY THOUGHT TO BE OF THE BANNED PIT BULL BREED – was given back to its owner despite worries it was dangerous. Cops say the man – named locally as David – was walking his Yorkshire Terrier yesterday when the gruesome incident occurred. He was transferred to hospital but later died of his injuries. One of his family friends spoke of her upset. Carol Hanson told the BBC: “We’re lost for words, just devastated. The incident has now been referred to the Independent Police Complaints Commission (IPCC) because the dog been seized by cops earlier this month. The animal was suspected of being a banned Pit Bull, but was returned to its owner when it was determined that it was not. A 29-year-old man, who owns the dog, was arrested in connection with the attack. He has now been released on police bail pending further inquiries. A witness told the Huddersfield Daily Examiner that the victim was savaged as he tried to protect his own little dog. The man was described as being left unconcious, having "lost half his weight in blood". Shocked onlookers apparently threw him a kitchen knife and urged him to stab the crazed animal. Cops who arrived on the scene are said to have tackled it with a fire extinguisher. West Yorksire Police's Detective Chief Inspector Mark Swift said: "Clearly our thoughts go out to the family at this tragic time. They are understandably devastated by what has happened and are being supported by specially trained officers." He added the suspect dog has been removed and taken to kennels. If it looks like a pit bull, if it bites, shakes, and holds like a pit bull, if it attacks like a pit bull, if it kills like a pit bull, it's a pit bull! It's too bad the pit bull was returned. This guy would be alive if it wasn't. But lets forget about some worthless guy, and focus on the ever important, god like pit bulls! If it was a lab it would look like one... If it was a poodle it would look like one. Funny how genetics and DNA always shine through in physical characteristics. It's not complicated! This story is so bizarre, I wouldn't have been surprised if it was from The Onion. And the police! The police were afraid to use tasers for fear of killing the killer! Unreal. Police hesitated to maybe, just possibly, by accident, kill a pit bull type dog that was not maybe, not just possibly, not by accident but quite purposely and intently in the act of killing a human being. Heaven forbid the pit bull type should die instead of a human being. I think the pit nutters should stop sending their surplus killer undogs to Canada and should start sending them to England instead. At least that way they'll know that no pittie-poo will die just for killing a person.